There are places in the world where whatever you look around seen perfect, romantic, harmoniously designed with the righ flower, architecture, the bright sun a little bit of warm and the most wonderful entertaiment. This places have the evocations of Disney Theme Parks Magic Kingdom, Hollywood Studios, Animal Kingdom and Disney Epcot. Theme Parks are perfect for a wonderfull day with your love of your live. 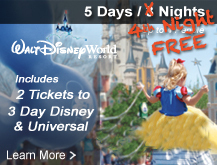 During the February on Valentine ’s Month Orlando Discount Tickets USA offer you special vacation packages for an extraordinary and affordable love getaway in Orlando, Florida. Choose your theme park, we give you 2 adult tickets and hotel stay for 4 days and 3 nights for only $169 while participating in our resort preview. Take the honey moon day feeling that you are traveling around de world while enjoying the World Showcase at Disney’s Epcot. During your visit include a Romantic Dinner at your favorite restaurant; Gastronomic options at Epcot are wide and exquisite. Spend a enhanced day at Disney Springs, have a romantic dinner and pamper you with souvenirs of something that you dream together. Make reservation for Discovery Cove to swim with the Dolphins. For this special event we recommend you reserve al least 2 months in advance. Enjoy a romantic moment while you presence the spectacular fireworks reserving a spot at Magic Kingdom. At the Tomorrowland Area Terrace fireworks Desert Party is possible to reserve seats. Fly over Orlando in a hot air balloon. This is a one in lifetime experience that evokes a lot of romance and peace. Select one of the days of your stay to get pampered at any of the Disney Resorts, look for couple massages or Spa services. 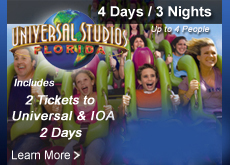 Orlando Florida is a city to fall in love and have unforgettable memories with your sweetheart, just visit our website www.orlandodiscounticketsusa.com to know more about our exciting and affordable offers. Yes, Big Party time is coming to Florida with Mardi Grass at Universal Studios, this year the celebration will run from February 3 t April 7. Universal Studios OrlandoMardi Grass is an authentic event and inspired on classic New Orleans Mardi Grass. Universal Studios will feature durig the festivity; floats, great performers, parades through the nights with tons of beadings. The name Mardi Grass resemble a pagan celebration after the “Thre Kings Day” until the common religions obligations returns. Typically at New Orleans this a celebration exclusive for adults but at Universal Studios Orlando the celebration is extended as well for family members. The ony element that might be excluded for children will be concerts depending on the arists. French Quarter Courtyard: Here is the main point of the Festival and where people congragate to met authentic New Orleans Bands and traditional Cajun Food for sale with Price range between $8-$10 dollars. Mardi Grass Float: It has a duration of approximately 25 minutes and it is about 45 minutes before the concerts starts. On 2016 beside the traditional floats full of beads will be new floats that celebrates other cultures and festivals around the world, for example: Venetian carnival, Fourth of July, Rio de Janeiro. For 2016 the parade wil stop 2 times at Hollywood and New York so performers interact directly with the public. Big Easy: It a a section that recreated a kids oriented Mardi Grass Celebration with costumes, parade, tons of beads and music. To buy your general admission with Orlando Discount Tickets USA for Mardi Grass at Universal Studios is only $39 dollar per person for the first 2 tickets by taking one of our resort preview..
.Visit Orlando Discount Tickets USA to plan your next visit to the Theme Parks of Universal Studios in Orlando Florida.